It is fairly simple to insert a YouTube Video in a blog but when you are designing a website inside WYSIWYG HTML editors like Adobe Golive CS2, Frontpage or Macromedia Dreamweaver, embedding that Flash Movie might involve some effort. I'm going a bit nuts from trying to embed YouTube video in a site I'm preparing as a demo for something larger. I'm a newbie, using Adobe GoLive, which seems easiest and most familiar in many ways. It's a snap embedding YouTube vids in my blog, too, as blogspot is set up for simplicity, but I just can't figure out how to do this in GoLive at all. Please help! Most HTML editors like Golive or Dreamweaver offer a Split HTML Source Code view meaning you can view / edit your site layout and HTML source simultaneously. Switch to the Split view by choosing "Show Split Source" from the View Menu. Open the Youtube video that you like to embed in your HTML webpage. Select & copy the entire HTML code from the "Embed HTML" box. 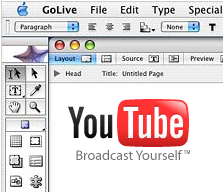 The final step - place your cursor in the Layout View of Golive where you have to place that Youtube Video. 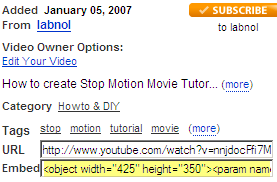 Now click inside the "Source View" and paste the Youtube HTML code from the clipboard. That's it. You can tweak the various parameter of the embedded video like Width, Height, Autoplay, etc directly from the GUI of Golive. Just remember that it may not be possible to preview the Youtube Video inside the HTML authoring tool but when the saved page is viewed inside a browser, the video would play just perfect. The above technique would work with just any multimedia format including MP3 audio, Real Video, Quicktime MOV video or Windows Media files.